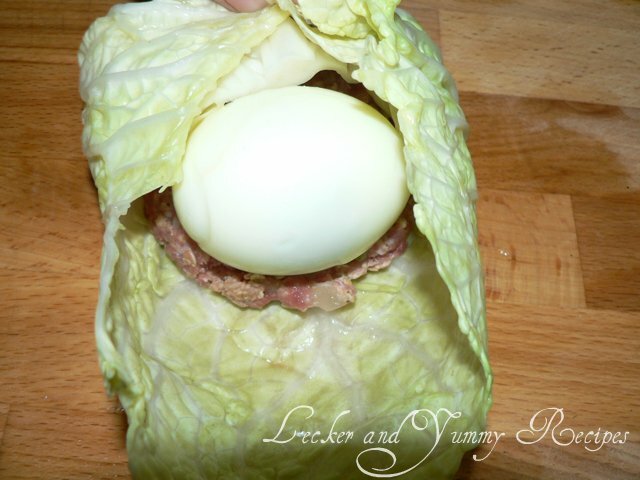 Wirsing Rouladen (read as Ru-laa-den), a German name given to the cabbage leaves wrapped around a filling which is usually based on minced meat, or rice, seasoned with herbs, spices and onions. 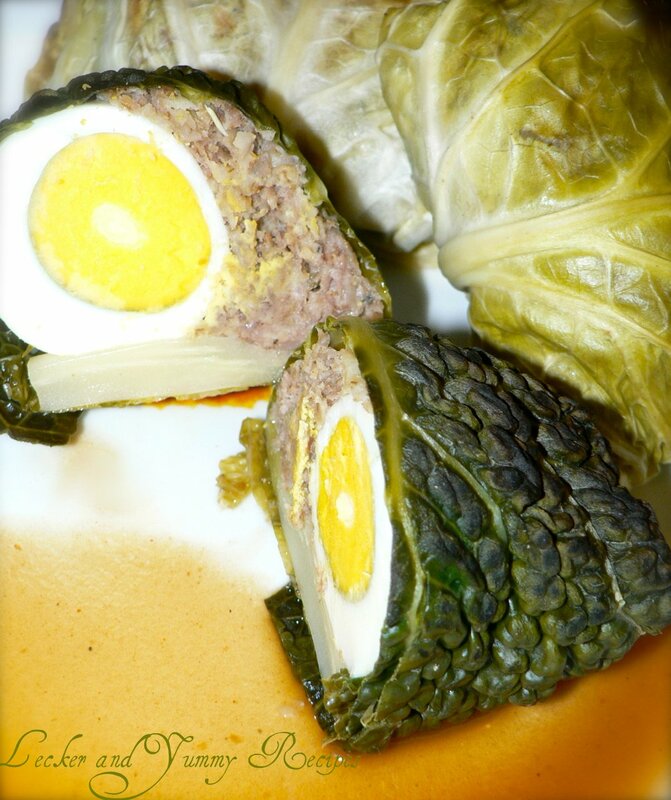 The rolls are then baked, simmered or steamed in a covered pot and eaten warm accompanied by a sauce. 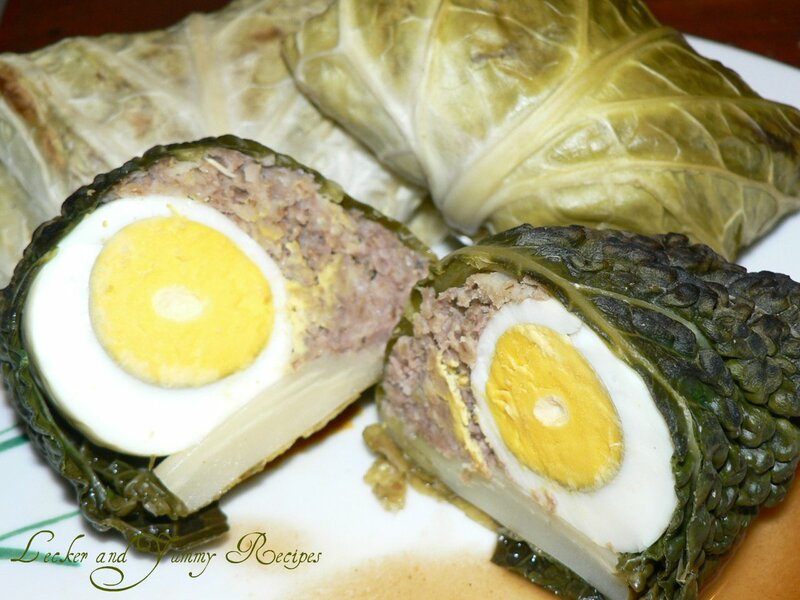 It is found in the cuisines of former Ottoman Empire from the middle east to the Balkans and Central Europe. 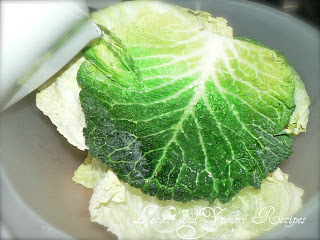 Its so much interesting to discover about the great health benefits and the nutritional value the Cabbage has! This leavy vegetable called the "drug of the poor" in medieval times, is unfortunately rarely added to our daily menu these days. With its high fiber content and anti-cancer properties, it is known to reduce the risk of colon cancer, boosts the digestive health and lowers cholesterol, reducing the risk of cardiovascular diseases. The juice of the cabbage stem is a good cure for ulcers. The vitamin C and sulphur in it purifies the blood and removes toxins. Some of the chemicals present in cabbage accelerate the body's metabolism of estrogen thereby reducing the incidence of breast, uterine and ovarian cancer in women ! Also, cabbage being very low in calories makes it a perfect diet food. After reflecting upon such health benefits of Cabbage, who will be having any second thoughts in including this nutrient rich vegetable regularly in our daily foods like soups, stews, salads, sandwiches? 1. Boil the eggs and peel off the shells. Set aside. 2. 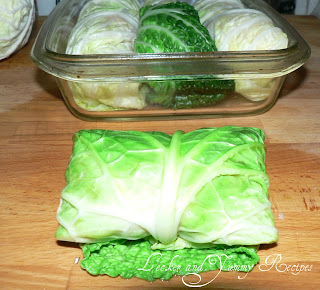 Remove and separate the desired quantity of cabbage leaves. Soak them in the boiled and salted water for 2-3 minutes. Drain the water and let it dry. 3. 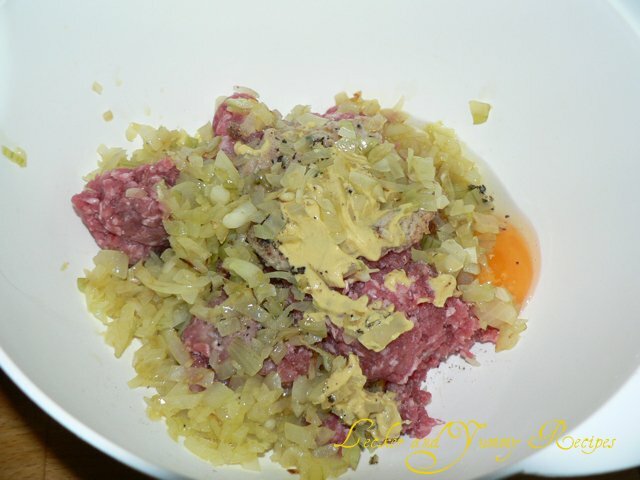 Combine the ground meat, chopped onions, mustard paste, spices, rolled oats and 1 egg. 4. 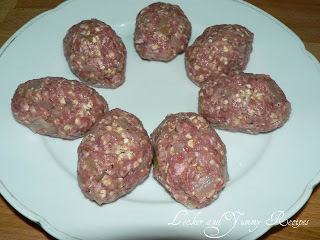 Make them into small oval balls. 5. Place this ground meat filling and a boiled egg on each leaf. 7. Repeat the procedure for the remaining leaves. 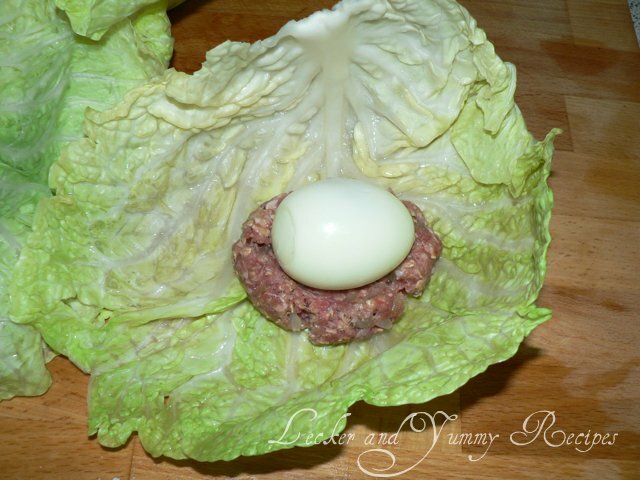 Closely pack the stuffed leaves in a dish lined with parchment paper. Cover it with aluminium foil. 8. 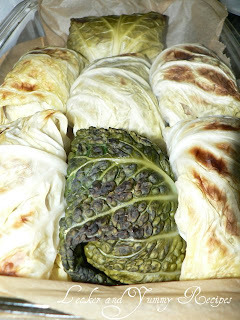 Preheat the oven at 175°C and bake the stuffed leaves for about 45 minutes. Remove the aluminium foil and then bake again for another 15 minutes. 9. Serve the Wirsing Rouladen with tomato sauce or any sauce of your choice. 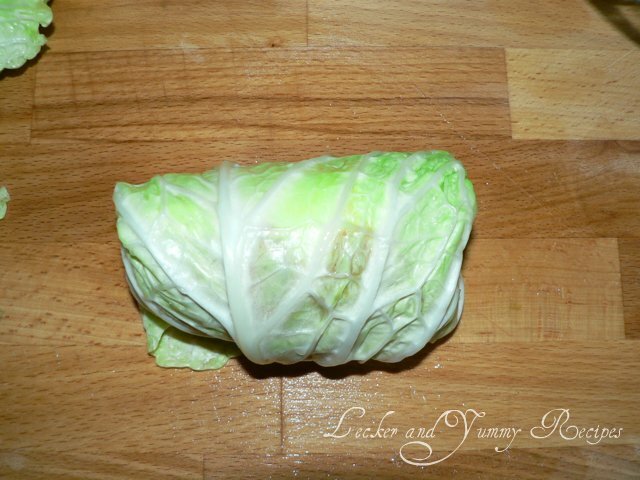 Alternatively, you could place the cabbage rolls in a large pot, pour water or tomato sauce, just enough to cover them and few drops of lemon juice(optional), close the lid and slow cook it in low flame for about an hour. Care should be taken every now and then not to burn it. 2. Melt the butter in a large pan. Saute the onions and the cabbage for about 5 minutes. 3. Sprinkle the flour over it. Add the water, vegetable stock, cream, salt and pepper. Mix well and let it cook for about 15 minutes until the stew thickens. 5. Serve the Cabbage cream soup with boiled potatoes or steamed rice or fresh bread ! This recipe takes part in the Gimme Green event, hosted at Chef Al dente. Wholesome meal Reshmi, roulade looks really fantastic. 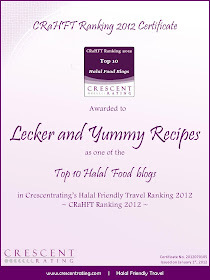 what a superb recipe that is. never knew of this. once Kylie Kwong cooked something similar called lion's head but the cooking process was quite different. You have been tagged, check this.